Both ISL and 802.1q provide trunking. The header used by each varies, and only ISL actually encapsulates the original frame, but both allow the use of a 12-bit-long VLAN ID field. So, either works fine and supports the same number of VLANs as a result of both using a 12-bit VLAN Number field. ISL and 802.1q both support a separate instance of spanning tree for each VLAN. ISL supported this feature much earlier than did 802.1q, so in years past, one of the stated differences between the two trunking protocols was that 802.1q did not support multiple spanning trees. To appreciate the benefits of multiple spanning trees, examine Figure 10-6, which shows a simple network, with two VLANs and three interconnected switches. You can tune STP parameters in each VLAN so that when all links are up, different interfaces block for different VLANs. In the figure, only one of the six switch interfaces connecting the switches needs to block to prevent loops. 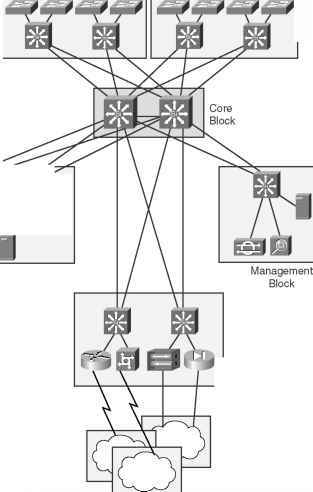 STP can be configured so that VLAN 1 and VLAN 2 block different interfaces on SW3. So, SW3 actually uses the available bandwidth on each of its links to the other switches because, on SW3, traffic in VLAN 1 uses the link to SW1, and traffic in VLAN 2 uses the link to SW2. Of course, if a link fails, both STP instances can converge so that a path is still available.